I have been compensated with complimentary tickets to this event for writing this post. However, all opinions are that of my own. I don't know about your kids but mine LOVE playing with LEGO® bricks. 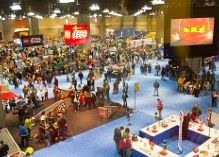 So when I heard that the award-winning LEGO KidsFest tour was coming to the Phoenix area I knew the kids would love it. Plus I am always on the look out for fun - out of the house activities to do with them. I am terribly sorry for the poor quality of these photos. They were the only ones provided to us to use in this post. We have never been to one of these events before but apparently they are going to have some new activities and popular interactive favorites. What to expect: hands-on building, creative experiences and one-of-a-kind activities. Such as, the LEGO Model Museum, Race Ramps, Creation Nation, Construction Zone, LEGO DUPLO, LEGO Retail store and LEGO KidsFest Marketplace, the Big Brick Pile, LEGO Ninjago and more. Children of all ages and builders of all skills and levels are welcome. This event is going to be held at the University of Phoenix Stadium in Glendale. 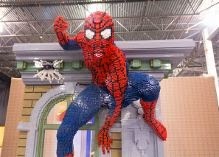 Please check out the official LEGO KidsFest site for more details on times, activities and how to purchase tickets. USFG is giving away (2) tickets to for the opening night session on Friday, February 27, 2015 (4-8:30pm). I encourage you to Follow LEGOKidsFest on Twitter and/or Instagram for all the latest ticketing updates as this event has been selling out in prior cities. Must be 18 to enter, 1 entry per day allowed. I am not the one hosting this giveaway! USFG is hosting the giveaway entries. Head over here to ENTER to win these tickets. even though I'm 21, I'd totally love to go to this, haha!